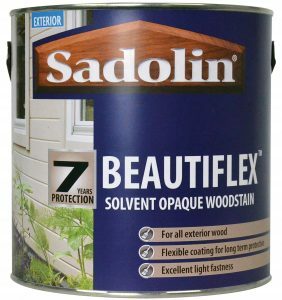 Water based, self-priming and versatile finish for all exterior wood, except decking, now with 10 Years Protection. Resists cracking, peeling and flaking. Ideal where a complete change of colour is required or a surface has become weathered. Touch dry in 2-4 hours. Recoat in 16-24 hours. Available in 250ml, 1, 2.5 & 5 litre packs. Super White, Black and Walnut are available off the shelf. Extensive colour range available from Colourmixing stockists. For coverage details and to work out the quantity for your job, use our calculator. 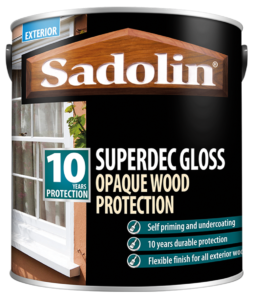 Durable, self-priming, water based, opaque finish for all exterior wood except decking, now with 10 Years Protection. Erodes naturally by weathering, ensuring the coating remains flexible and resists cracking, peeling and flaking. Apply to new and previously painted or stained surfaces. Ideal where a complete change of colour is required or a surface has become weathered and uneven. Touch dry 2-4 hours. Recoat in 16-24 hours. Available in 1, 2.5 & 5 litre packs. For coverage details and to work out the quantity for your job, use our calculator. A multi-surface coating with UV inhibitors, offering up to 7 years protection. Perfect for use on all garden surfaces including wood, decking, stone, terracotta, plastic and metal. A solvent based paint, touch dry 4-6 hours. Recoat in 16-24 hours. Available in 2.5 litre packs. For coverage details and to work out the quantity for your job, use our calculator. 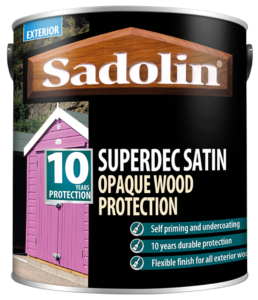 A solvent based opaque woodstain, offering up to 7 years protection for all exterior wood, including decking. Superior flexibility coating for long term protection with excellent light fastness. Extended colour range available from Colour Mixing stockists. Ask in store for details. Touch dry 4-6 hours. Recoat in 16-24 hours. Available in 1 & 2.5 litre packs. White, Black and Hickory are available off the shelf, while our extended colour range is available only from Colourmixing stockists. For coverage details and to work out the quantity for your job, use our calculator. 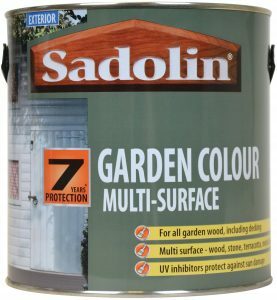 Sadolin Colour mixing is available in this range, ask in store for this service.